Click here for a summary of the Yanks wins in 2000. Yanks raise 25th World Series flag and then beat Texas 8-6. 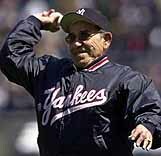 Yogi throws out the first pitch. This unofficial Yankee site has been accessed times since my first day on this server on 7/25/99. This web site was viewed over 1000 times between 11/7/98 and 7/24/99 on my former internet server. Thanks, and keep coming back. This site is best viewed with Internet Explorer 4.0 or Netscape Communicator 4.0 or higher.